Despite the fact it’s not exactly an urban, late-night delivery joint, China 1968 (500 Broadway) in El Cajon also offers its own brand of “authenticity.” Part of it’s the menu, part the nostalgia and part the unique mix of comfort and exotic flavors. Take, for example, General Tso’s chicken. If you’ve ever been to an American Chinese restaurant you probably know the dish. The name—the only thing the Qing Dynasty general loaned this dish, which is utterly unknown in its “homeland”—seems to scream history. In fact, the flavors go no further back then the middle of the last century at Shun Lee Palace restaurant in New York, where it gained popularity. That’s what China 1968 offers: deep fried chunks of chicken in a thick and sweet sauce (soy, rice wine vinegar, sugar and more-than-a-tad of cornstarch) along with whole dried red chili peppers, vegetables and broccoli florets that are only slightly less luridly colored than the classic version. It’s a flavor profile perfectly calibrated for the American palette. It may not be very Chinese, but it’s a really tasty guilty pleasure. Innovation is not what most of China 1968’s menu is about. Indeed, it is quite the opposite. The classic Chinese food joint is selling speed, consistency and comfort every bit as much as the corner McDonalds. And so, in addition to the general’s chicken, China 1968’s menu includes hot and sour soup, kung pao chicken, egg foo young, lo mein, mu shu pork and the like. The hot and sour soup was exactly as you would expect, hot (from white pepper), sour (from vinegar), with vegetable goodies hiding inside a murky, dark, meaty broth thickened with a truckload of cornstarch. The kung pao chicken disappointed, lacking real heat (or the tingle of Sichuan peppercorns), with its flavors dulled by a characterless brown sauce. The marvelously retro egg foo young offered a different brown sauce that worked better. 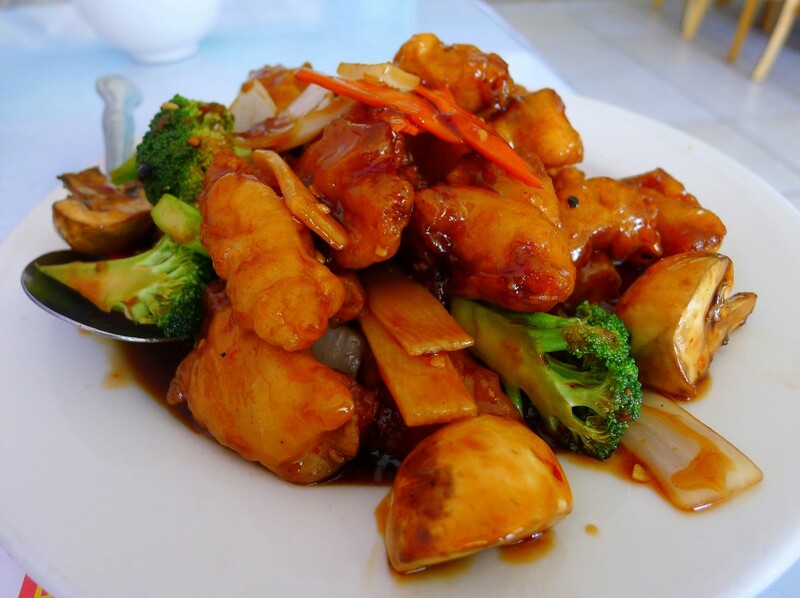 This Chinese fried omelette came piled high with vegetables and smothered in a gravy-like sauce. The mixed lo mein with beef, pork and shrimp was a well-executed stir-fried noodle dish, perhaps one of the American Chinese Top 40 most similar to its mainland analog. However, the best dish at China 1968 was the somewhat unconventional Szechuan braised string beans. Fried to perfection then stir-fried with dried chili peppers, onions and pork, this dish hit savory, umami and spicy notes. It was not a dish I expected from China 1968 or would expect from a New York late-night Chinese delivery joint. But the place has more than enough of those to keep those Yelpers and Chowhounders happy.